Don’t miss our Holiday Sale!!! Going on NOW through Dec 1st! 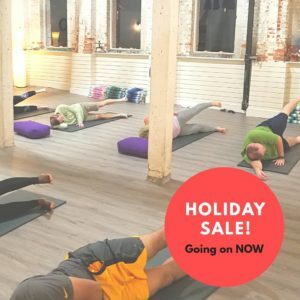 $99 Holiday Class Pass – UNLIMITED group classes from 11/23 through 12/31! Holiday Class Pass may be used on any Yoga class (other than Aerial Yoga), Pilates Mat, Stretch Therapy, Pilates/Stretch Combo Class, or Kettlebells & Cardio (if you have taken Intro to Kettlebells). You may NOT use this package on Tower classes or Aerial Yoga classes. Open an Account and we will add 10% to it! Already have an Account? Add any amount to it, and we will add 10%, of your deposit, to your Account!! Holiday Class Pass may be purchased online, over the phone, or in person. Account deposits must be made in person or over the phone.